WASHINGTON, DC, September 17, 2012 (ENS) – More than 300 public interest groups representing millions of people from all 50 states sent a letter to the U.S. Senate Friday opposing S.3512, the Coal Ash Recycling and Oversight Act of 2012. This bill would remove responsibility for coal ash management from the federal government and hand it to the states. Coal ash, the by-product of burning coal, contains toxic heavy metals such as arsenic, cadmium, hexavalent chromium, lead and mercury. Billions of tons of this toxic waste are stored in unlined ponds, landfills and mines in almost every state. Introduced August 2 by Republican Senator John Hoeven of South Dakota, and Democrats Kent Conrad of South Dakota and Max Baucus of Montana, S.3512 prevents the U.S. Environmental Protection Agency from finalizing its proposed coal ash rule or ever issuing regulations for the nation’s second largest industrial waste stream. The bill reinforces a regulatory determination made by the EPA in May 2000, during the early months of the Bush Administration, that fossil fuel combustion wastes “do not warrant regulation” under the Solid Waste Disposal Act. But the public became alarmed in December 2008, when one billion gallons of coal ash sludge spilled from a collection pond at Tennessee Valley Authority’s Kingston Fossil Generating Station at the confluence of the Emory and Clinch rivers in east Tennessee. The Tennessee Valley Authority is a federal government agency, but the ash disposal pond that failed had been permitted by Tennessee Department of Environment and Conservation as a Class II Solid Waste Landfill. The wave of water and ash from the broken pond destroyed three homes, disrupted electrical power, ruptured a natural gas line adjacent to the plant, covered a railway and roads in the area, and required the evacuation of a neighborhood. Now, more than three-and-a-half years later, cleanup of the massive spill continues. Over 350 TVA employees are building a wall to contain the coal ash in a landfill near the Emory River. According to the EPA, there are still 510,000 cubic yards, or more than 100 million gallons, of coal ash covering the river beds. On August 23, a federal judge ruled that the TVA was responsible for the spill in a decision that was viewed as a victory for more than 800 property owners who sued for damages because of negligence. TVA has purchased 180 properties, settled more than 200 other claims submitted by area residents and provided $43 million to the Roane County Economic Development Foundation for use by affected communities. 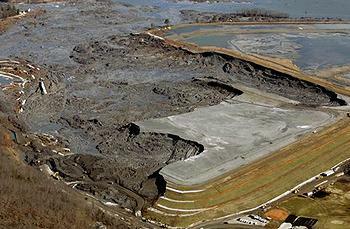 In June 2010, the EPA proposed for the first time to regulate coal ash. The federal agency proposed two alternatives – to regulate coal ash either as a hazardous or a non-hazardous waste under the Resource Conservation and Recovery Act. The public interest groups have no confidence in state-by-state management of coal ash. “This flawed bill fails to mitigate the risk of another human health and environmental disaster and leaves our water sources open to contamination with dangerous heavy metals. While claiming to be a solution to our coal pollution problem, this bill is merely a giveaway to industry that will hurt the health and well-being of millions of Americans,” the letter states. Industry expressed its opposition to EPA management of coal ash as hazardous waste in a letter to the House of Representatives last October signed by 38 manufacturing groups. They support a House bill that would strengthen state programs and give states the ability to regulate coal ash because, they say, that approach would support the reuse of coal ash in construction materials such as cement, shingles, wallboard, and bricks. The public interest groups contend that EPA regulation would better manage wind dispersal of coal ash. S.3512 deals with wind dispersal of coal ash by tasking the states with requiring owners or operators of coal ash impoundments to cover the ponds or wet them down. But the public interest groups are not persuaded that the states can manage coal ash better than the U.S. EPA. “S. 3512 not only obstructs the EPA from doing its job, the legislation encourages inadequate state programs that preserve the status quo and extend the lives of hundreds of leaking toxic dumps,” their letter states.